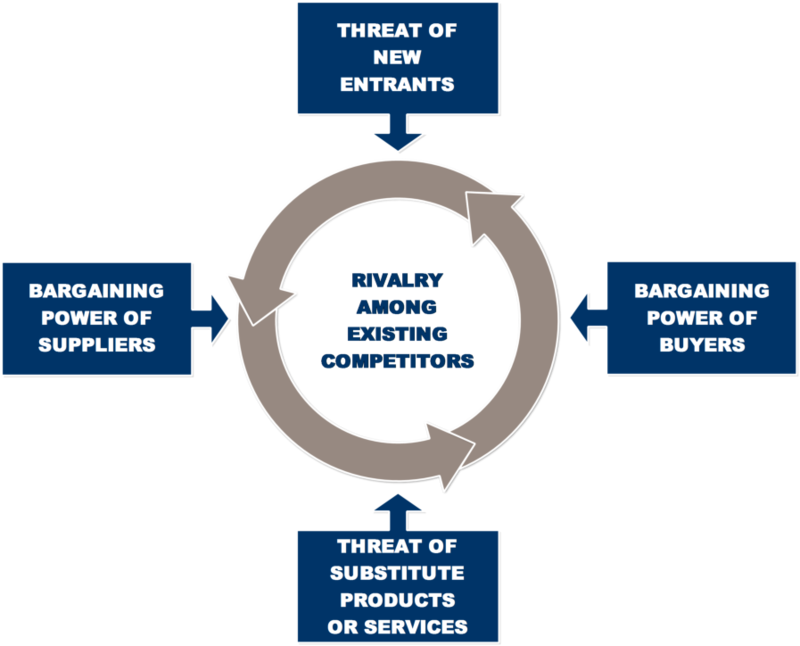 The five forces of competition concept is one of the most influential in modern business. It was developed by Michael Porter of the Harvard Business School. Like all good frameworks, it takes something complicated and provides a simple, shorthand method to understand and remember the concepts. This is the next post in my series of fundamentals through graphics, charts, and graphs. Revisiting fundamental business concepts is helpful. We last did this in the post on the economies of scale and the experience curve developed by the Boston Consulting Group in 1966. “The collective strength of these forces determines the ultimate profit potential of an industry,” writes Porter. 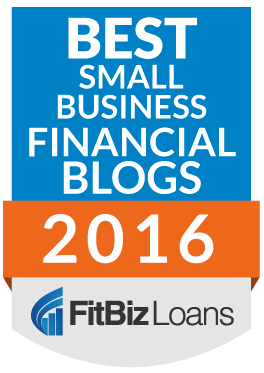 These concepts are important to any business owner trying to determine how better to compete within an industry. Or, they are important to any entrepreneur contemplating a venture in an industry where they want to understand the industry dynamics. Here is a quick summary of the Five Forces (more detailed reading can be found through Harvard Business Review articles by Michael Porter and his books). Threat of new entrants. This is the classic analysis of how high are the barriers to entry in a market. Some classic barriers to entry are economies of scale, product differentiation (company is set-up to offer things competitors cannot), capital requirements, regulatory limitations, and distribution channels. Any analysis of an industry should begin with how easy is it for new entrants to enter because if it is easy, there will be a constant flood of entrants eager to earn market share or distract your valuable customers with their offerings. Bargaining power of suppliers. 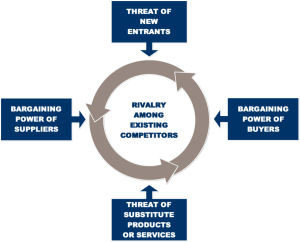 Obviously, if a company is dependent upon a certain supplier or suppliers, they are at a high risk that their profit margins will be eroded by those suppliers making increasing demands upon the company. At its worst, this has been called “supplier hold-up” where they can hold-up your company until they get what they want. This is not a good place to be. Bargaining power of customers. Similarly, if your company has little ability to combat price erosion or other customer demands, the profit potential of your business will be constrained. Threat of substitute products or services. Substitutes are a different product, but something that customers may be tempted to use to replace your product. High-fructose corn syrup as a substitute for sugar. Train travel as a substitute for airplane travel. Video game entertainment as a substitute for movie entertainment. Rivalry and jockeying among existing competitors. Some industries are intensely competitive while some industries are a sort of friendly rivalry (for decades, the competition between Coca-Cola and Pepsi did not lessen the profitability of either). Intense industries, according to Porter, tend to be ones that have many competitors, slow growth, high fixed costs (because they are tempted to reduce marginal prices), high exit barriers, etc. Anytime I provide financing or funding for businesses through my investment partnership Greybull Stewardship, I think about the five forces in the industry of the company. And, anytime I am thinking about strategy and building competitive advantage for our companies, it is helpful to refer to the five forces to make sure we are not missing anything.